HP also announced the expansion of its innovative Open Materials Platform with new partners Dressler Group and Lubrizol, as well as three new forthcoming 3D printing materials: HP 3D High Reusability PA 11 and HP 3D High Reusability PA 12 Glass Beads4, and the future availability of HP 3D High Reusability Polypropylene. The new materials, developed at HP’s innovative 3D Open Materials and Applications Labs, will broaden the uses and capabilities of HP Multi Jet Fusion technology and open a world of new high-volume applications. The new HP solution includes hardware and firmware upgrades for existing Jet Fusion systems to improve overall system efficiency and enable continuous operation, including a new processing station capable of handling significantly higher materials volumes. 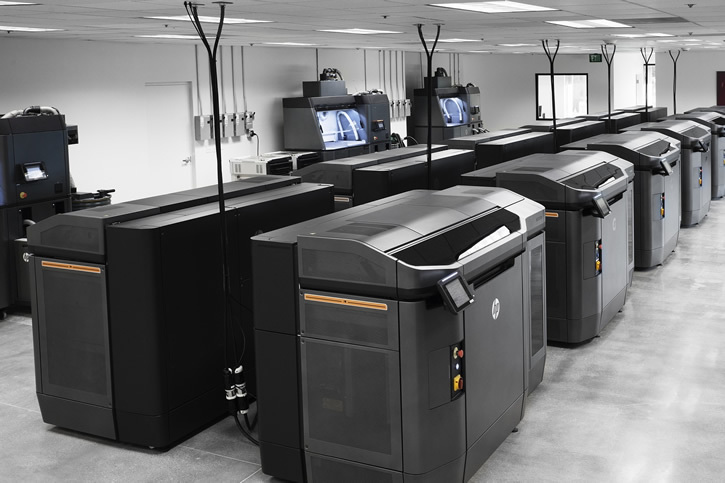 Customers who purchase the HP Jet Fusion 3D 4210 Printing Solution will also benefit from shared service contracts and significantly lower pricing on HP’s engineering-grade 3D printing materials and agents. HP 3D High Reusability PA 11: for producing low-cost, high-quality functional parts with impact resistance and ductility for prostheses, insoles, sporting goods, snap fits, living hinges, and more. HP 3D High Reusability PA 12 Glass Beads: for producing low-cost, high-quality functional parts with dimensional stability and repeatability ideal for applications requiring high stiffness like enclosures and housings, molds, and tooling. HP 3D High Reusability Polypropylene: Durable low cost material that offers enhanced flexibility with excellent chemical resistant, lightweight, and watertight capabilities. Dressler Group, the world’s authority in specialized grinding and refining chemotechnical products, will be providing HP’s materials partners preferred access to its toll grinding manufacturing capabilities, helping to remove one of the main barriers to 3D materials development. Dressler is a preferred HP partner for developing and manufacturing powder for HP Multi Jet Fusion 3D printers. Lubrizol, a Berkshire Hathaway company and global leader in specialty chemicals production with one of the broadest and deepest portfolios of TPU (thermoplastic polyurethane) in the world, joins to accelerate the development of innovative materials designed for final part production with HP Jet Fusion 3D systems. The power of HP’s Open Materials Platform approach is quickly emerging, with more than 50 chemical companies actively engaged, including newly-added market leaders Dow Chemical and DSM. Dow and DSM are among the companies that have acquired HP’s industry-first Materials Development Kit (MDK) with the objective of developing 3D powders for Jet Fusion 3D printers in collaboration with HP. Additionally, existing HP Open Materials Platform partners Evonik and Henkel have acquired HP Jet Fusion 3D printers to accelerate customized applications development. Evonik is currently investing in powder capacity expansion and business resources to support the market in the transition from prototyping to real manufacturing, which includes the investment in Jet Fusion printers to develop customized powders for several different applications. Henkel, recently announced as the first HP Jet Fusion global reseller, is focusing on accelerating 3D printing adoption and developing materials for custom applications. To learn more about HP’s 3D printing innovations and vision for the digital industrial revolution, visit Booth #E40 in Hall 3.1 at formnext 2017. Based on internal data and simulation when printing a 5 cm3 part. Cost analysis based on: standard solution configuration price, supplies price, and maintenance costs recommended by manufacturer. Cost criteria: printing 1.4 full build chambers of parts per day/5 days per week over 1 year of 5 cm3 parts at 20% packing density on fast print mode using PP material, and the powder reusability ratio recommended by manufacturer. PP material will be commercially available in mid-2018. Based on internal testing and public data, HP Jet Fusion 3D 4210 Printing Solution average printing cost-per-part is 65% lower versus the average cost of comparable fused deposition modelling (FDM) and selective laser sintering (SLS) printer solutions from $100,000 USD to $300,000 USD on market as of April, 2016 and is 50% lower versus the average cost of comparable SLS printer solutions for $300,000 USD to $450,000 USD. Cost analysis based on: standard solution configuration price, supplies price, and maintenance costs recommended by manufacturer. Cost criteria: printing 1.4 full build chambers of parts per day/5 days per week over 1 year of 30-gram parts at 10% packing density on fast print mode using HP 3D High Reusability PA 12 material, and the powder reusability ratio recommended by manufacturer. The HP Jet Fusion 3D 4210 Printing Solution will be commercially available in March 2018. HP 3D High Reusability PA 11 will be commercially available in mid-January 2018. HP 3D High Reusability PA 12 Glass Beads will be commercially available in mid-December 2017. Industry-leading surplus powder reusability based on using HP 3D High Reusability PA 12 at recommended packing densities and compared to selective laser sintering (SLS) technology, offers excellent reusability without sacrificing mechanical performance. Tested according to ASTM D638 and MFI test using HDT at different loads with a 3D scanner for dimensional stability. Testing monitored using statistical process controls. Liters refers to the materials container size and not the actual materials volume. Materials are measured in kilograms. This entry was posted in News and tagged 3D Open Materials and Applications Labs, Arkema, BASF, Chemical, Corey Weber, Dow Chemical, Dr. Matthias Kottenhahn, Dressler Group, DSM, Evonik, formnext 2017, Henkel, HP Inc., HP Jet Fusion 3D 4210, Hugo da Silva, industrial-scale 3D manufacturing, Jan Dressler, Jet Fusion 3D 4210 Printing Solution, Lehmann & Voss, Lubrizol, Materials Development Kit, Multi Jet Fusion, Open Materials Platform, PA 11, PA 12 Glass Beads, Polypropylene, Ramon Pastor, Rick Tolin, Sinopec Yanshan Petrochemical, thermoplastic polyurethane, “HP’s Jet Fusion 3D systems by AM. Bookmark the permalink.